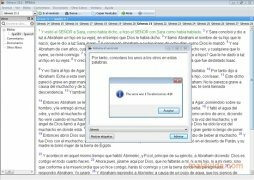 BPBible is a tool that you can use to study, read or consult the Bible, or any other sacred book. Furthermore, you can check dictionaries and comments from various authors. BPBible also allows you to play a game in which you'll have to guess the name of a specific verse from a sentence. If you like reading the Bible, with BPBible you will be able to access different versions and translations. To be able to use BPBible you'll have to install books, dictionaries and commentaries. Once you have included them in the application, you'll be able to read them, search for specific texts or create your own comments. Furthermore, BPBible allows you to copy the verse that you are most interested in, configure the zoom size to be able to read the text more clearly or tag the texts. 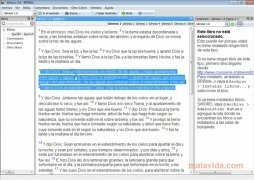 BPBible is also very useful if you want to study the Bible's texts. It has a feature that will allow you to try to guess the name of a verse after reading a sentence. Thanks to this you'll be able to memorize and identify full verses thanks to extracts. If you're interested in the Bible and other Holy Scriptures, try BPBible.